It’s the afternoon the mountains just outside Fujairah. Having covered our fair share of sinuous mountain asphalt over the last two hours, our convoy has just crunched its way onto a very dry former lakebed for the final leg of our photoshoot, dust crumbling away from the cracked surface as each tyre crawls along and lingering almost ominously in the air around us, dissipating the rays of the afternoon sun as it does so. The only audible sound is heated metallic panelling ticking itself cool. Eerily, we’ve somehow ended up in prehistoric Utah. This is where my focus should be, but instead, it’s drawn by an argument that’s broken out amongst the crankandpiston.com team: the new Audi RS 3 Sportback, the Mercedes-AMG A 45 and the Volkswagen Golf GTI Clubsport each has an ardent supporter, igniting the prospect of a dead heat. Understandable, for here is a group that truly highlights how far the humble hot hatch and the expectations of performance thereof have developed over the years. When it was first released back in 1975 for instance, the first generation Golf GTI boasted 108bhp, weighed just over 800kg, and took close to nine seconds to get to 100kph. By comparison, the Clubsport anniversary edition we’re testing today produces 178bhp MORE than its forefather, weighs in excess of 1300kg and gets the run to the ton done in just under six seconds. It’s a prospect that raises further eyebrows when you consider the Clubsport is not even the fastest hot hatch of our group, it being flanked by both the fastest production hot hatch on the planet – the 376bhp AMG A45 – and the model it top trumped for the accolade, the 362bhp RS 3. 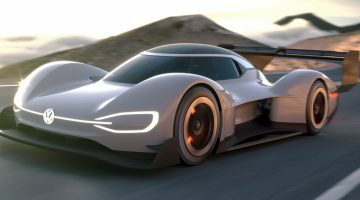 This is the kind of power that could legitimately give the Porsche 718 Boxster a run for its money in a straight line. Indeed, my crankandpiston.com colleague Jamil’s initial enthusiasm for the Audi has already been rubber-stamped by the speed delivery of the RS 3’s 2.5-litre turbocharged five cylinder. An enthusiasm initially ignited by the cabin design, a point he proves by swinging the door open. All consideration for photographer Arun’s setup are immediately forgotten, much to his barely contained chagrin. Jamil does have a point. The RS 3 cabin is indicative of Ingolstadt’s typically excellent build quality, complete with swathes of leather upholstery, aluminium switchgear, and beautifully gripping Sport Seats. It’s in the details though that the Audi really impresses: when not in use, the infotainment screen slides elegantly into the dashboard; the removable closed-top ashtray has been embossed with the four rings; save a rotary dial and a couple of switches, there’s barely any switchgear to clutter the centre console. Plus, on the highway, Jamil assures me that the ride comfort – even despite some specially stiffened suspension – is excellent before defiantly resting his case. Impressive opening argument, and the Audi cabin does indeed look stunning. If perhaps a little sensible. This after all is a hot hatch, a ballistically powered and – let’s be frank – quite pricey one too at just under $60K. Save a dash of Alacantara on the flat-bottomed steering wheels and red cross-stitching, where’s the flamboyance? You could say the same of the outside too, the chromed wing mirrors, some flashy 18in alloys and duplicate ‘RS’ badges about it in terms of shoutiness. Not a problem the Mercedes-AMG suffers, chimes owner Mohammed Al-Yassi. The A 45 has never shied from extrovert styling, tail-lip spoilers, gaping air intakes and ‘AMG’ badges up the whazoo just the opening layer of a very shouty cake. And the World Champion Edition with us today only adds to that visual loudness. Produced in limited numbers to celebrate Mercedes’ double Formula 1 titles last year, a silver and ‘petrol green’ livery, a larger front splitter, a green rim flange (yikes!) and stonking great rear spoiler don’t so much ‘nod’ to parallels with the championship winning F1 W06 as knock them down and kick them in the teeth. 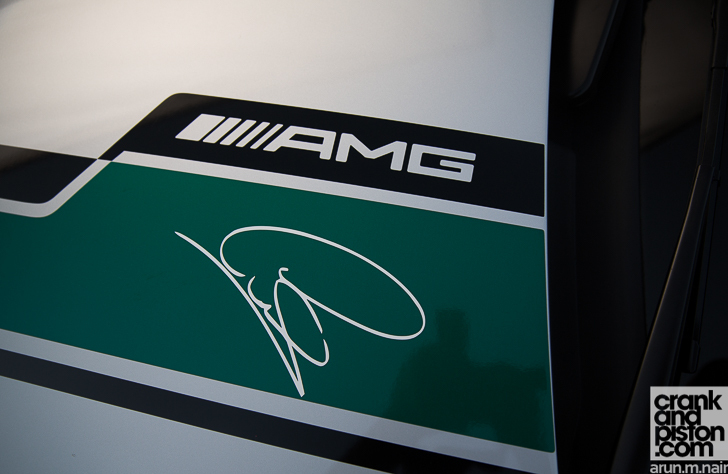 Even Lewis Hamilton’s signature adorns the bonnet. This is also the very first – and, at present, only – World Champion example in the Middle East. Mohammed is a big fan of AMG‘s pocket rocket, even going so far as to buy this example sight unseen. 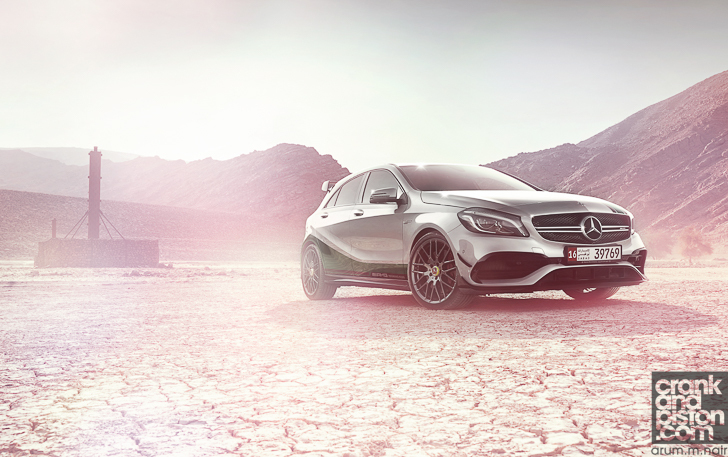 It’s no surprise the A 45 is his favourite of the three. In the crankandpiston.com office car park this morning though, my eyes went straight to the Golf. 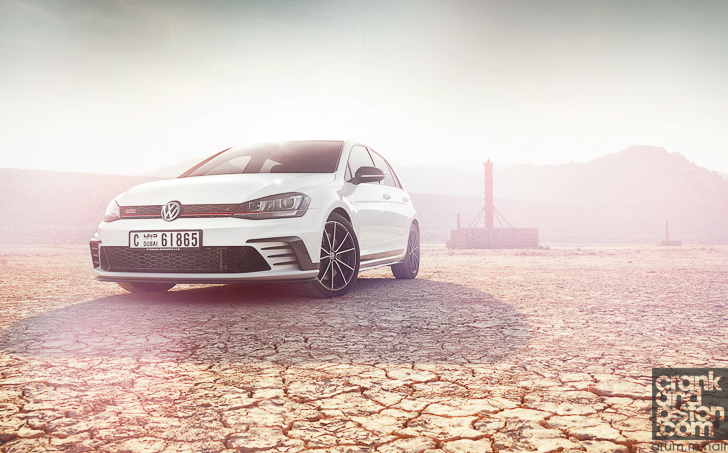 Unveiled at Wörthersee last year, the Clubsport celebrates 40 years of the iconic ‘GTI’ badge, and Volkswagen has added much more than just a new paint finish. A deeper front splitter, and rear diffuser means the Clubsport is the first Golf to both generate downforce and reduce lift. There’s a new rear spoiler, some rather cheeky ‘Clubsport’ lettering down the flanks in a nod to the original GTI, and an enticing ‘boost function’ for the 2-litre turbo four-cylinder: pin the throttle and for ten seconds peak horsepower rises from 261bhp to 286bhp, making the Clubsport the most powerful production GTI we’ve driven. When the firing pin is pulled though, there’s no spine-tingling boom of exhaust notes. Rather a low metallic four-pot warble that does pale in comparison with the more emphatic Audi and Merc. Fears that the Clubsport lacks sporting character though would be fruitless, tartan check cloth seats, faux carbon fibre detailing and some ‘GTI’ doorsills checking the boxes adequately. Impressively, even with its stiffened suspension and a revised chassis setup, the ride comfort offers more cosseting damping than both the Merc and the Audi, an MQB platform it ironically shares with the latter. Plus, as we’ve come to expect from the Golf, both seating position and support are exceptional. Tick, tick, very much tick from the Clubsport. Then it hits the corners. The neutral balance remains one of the GTI’s most revered qualities, its ability to remain flat and composed through the turns not undone by that additional power. Quite the opposite in fact, those chassis tweaks making the Clubsport feel altogether more lithe and athletic over the standard GTI, which was hardly an unwieldy shopping trolley to begin with. Clad out with super sticky Michelin Pilot Sport Cup tyres means massive amounts of grip and, as a result, makes for a much stronger front end: whereas previously the GTI could occasionally teeter on the brink of understeer, both the level of grip and ceaseless traction means at road speeds the Clubsport never threatens to become ragged. Turn-in hard and the tyres just bite, allowing me to get back on the power more quickly, there’s never a threat that the nose will just limply wash wide. Consistent steering has never been an issue for the Golf, yet even more weight has been dialled in, making the Clubsport even easier to hustle. The depths with which I can lean on the front end are incredible, as is the mid-corner adjustability. The Clubsport’s agility through the switchbacks starts to feel almost instinctive. It’s an engagement I haven’t felt behind the wheel for quite some time, and it’s enormously satisfying. It’s the power delivery that really peaks my interest though. Boot the right pedal off the line and there’s very faint traces of torque steer, though fortunately not enough to unsettle the front end considerably. We’ve lauded VW’s DSG gearbox many times in the past, smooth and swift gear changes once again the order of the day. It’s the acceleration though that gets me, deep reserves of torque across the board keeping turbo lag at arm’s length and a top end that nudges the red line in tandem producing a beautifully progressive pick-up. It might lack, as I later find out, the explosive nature of the Audi and the Mercedes, but it’s beautifully, wonderfully, fantastically spirited. I already love the Clubsport. Completely. Making it a horribly tough act to follow, akin to Miley Cyrus doing a double set after The Beatles. Jamil’s still not convinced though, leading to a swapping of keys as he decants himself into the VW and I into the Audi. The five-cylinder soundtrack blows the Volkswagen’s four-cylinders into the Cretaceous dust cloud. Granted this bass dips on the move and doesn’t quite match the initial fury under start-up, but hold the lower gears and it’s a mighty punch to the eardrums. And the spine. It’s devastatingly rapid, and the power delivery is immense, particularly lower down the range when the turbocharger really begins to get into its stride. It’s a far cry from the more subdued speed pick-up of the VW, which has already begun to disappear on the straights. Into the corners, there are herculean amounts of grip for immense turn-in bite, allowing me to carry in much more speed than I’d expected. With each passing corner, suddenly there’s renewed bravery to lean on the front end even harder courtesy of the traction delivered through that Quattro all-wheel drive system. There’s a key difference though to the VW. Yes, there’s an enormous amount of grip, but there’s also a slightly deadened sensation through the steering and – more importantly – an additional 145kg to consider: compared with the 1375kg VW and the 1480kg Merc, the lardy Audi tips the scales at 1520kg, which can be felt. When you eventually break traction, the front tyres will start to scrub, necessitating a balance in the RS 3 between corner entry speed and out-and-out front end muscle. 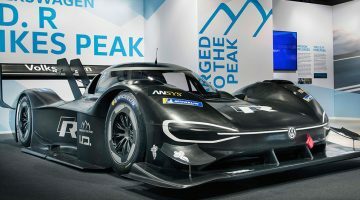 Certainly the stopping power of the brakes is more than capable under such circumstances, but extended runs will eventually have these calling for time out. Adjustments mid-corner prove rather more difficult though, the chassis not quite as tight on the Audi and not cornering anywhere near as flat as the Clubsport. There are a couple of saving graces though. Even despite the stiffened suspension not sufficiently eroding lean in the cabin, it doesn’t seem to have affected the ride quality, the wishbones soaking all but the most rutted of surfaces. 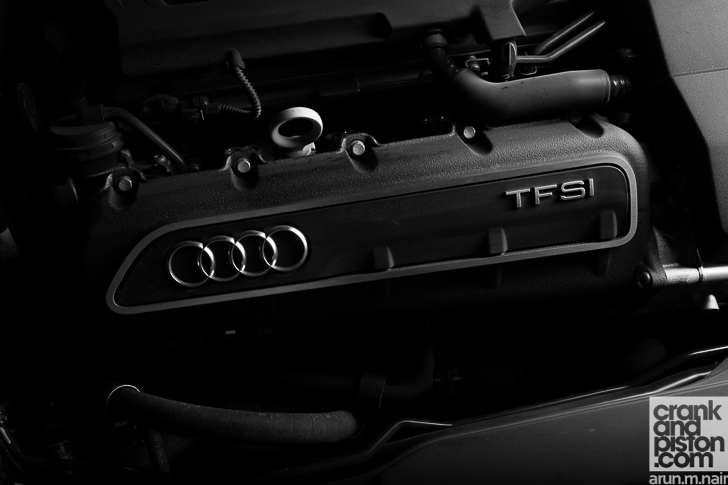 Similarly downshifts through the seven-speed may lack responsiveness but the crisp, almost ratchet-like shots fired by the gear changes on the way up the box do a solid job igniting the barely controlled fury that is that turbocharged five-cylinder. I would take a stab at the overly light steering in Comfort were it not for surprisingly constant heft lock-to-lock in Dynamic, and the fact that this is a notable improvement over the less precise, more lurching nature of the first generation model it replaces. 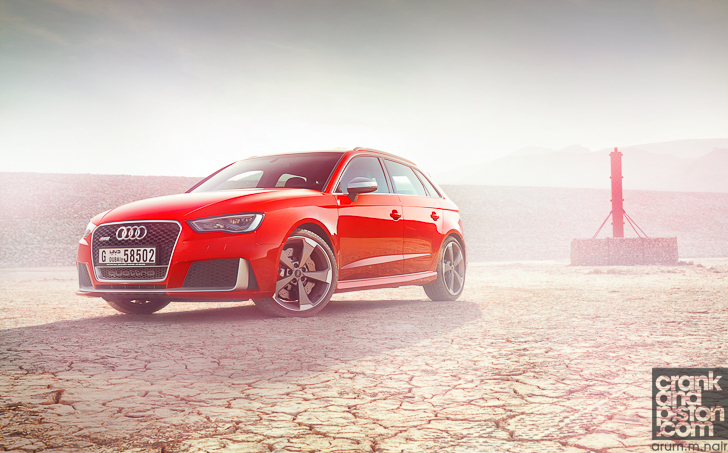 Digs aside, Audi has done a stellar job turning the RS 3 around. Back on the lake bed, individual shots of the Mercedes are being wrapped up, and Mohammed is busy taking notes: as well as being an all round top bloke, he’s also a prolific photographer, and he’s busy picking Arun’s brain. He’s also pawing at the keys to the Audi to compare notes, glibly handing me the AMG keys. There’s a smile as he does so. I’ve just mentioned the power and the delivery of the Audi. He assures me I’ve seen nothing yet. He’s right.